German-speaking countries are renowned for their long tradition of fine baking. backaldrin’s master confectioners set themselves apart by creating classics, exploring current trends and developing new recipes, from sweet yeast dough rolls and Kaiserschmarrn (Emperor’s pancake) to delicate chocolate soufflés that are absolute heaven for bakeries with bistro or restaurant services. However many legends surround the name of the Kaiserschmarrn, the fact remains that it has enjoyed great popularity since the 19th century. With BiskuitMix Fine, whole egg, milk, butter and rum, it’s easy to please even an Imperial palate in next to no time. The batter can be prepared and left at room temperature for several hours without losing quality. When cooking in a pan, the lid provides the necessary steam to ensure a deliciously fluffy end result. A hint of caramel adds that special touch; the pancake pieces are pushed to the sides of the pan while the butter-oil mixture caramelises with the sugar in the centre. The cooked pancakes can be kept for longer in the combi-steamer. 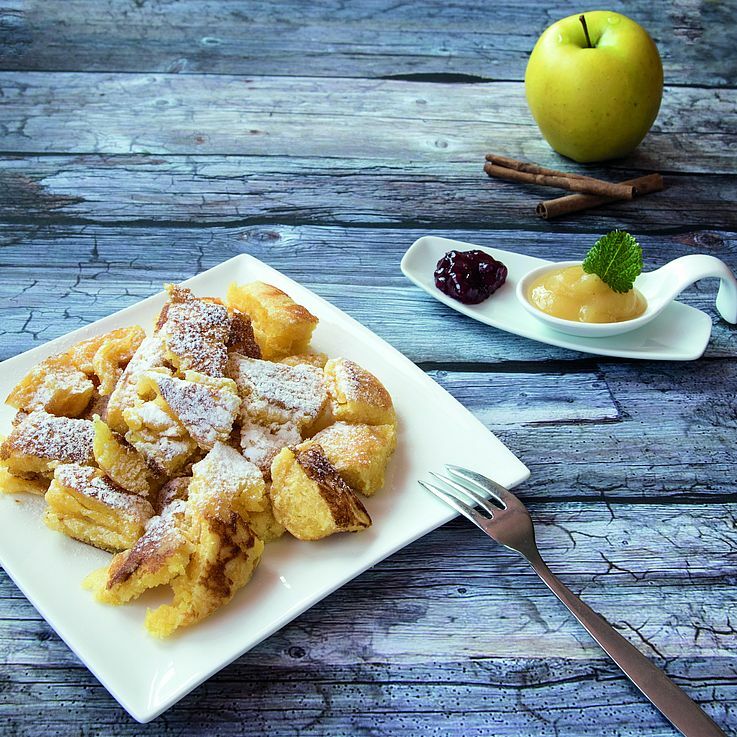 Served with apple sauce, stewed plums or fruit coulis, Kaiserschmarrn is a truly unique indulgence. Just as traditional as Kaiserschmarrn are the sweet yeast dough rolls, known as Buchteln. Typically filled with plum jam, the tasty buns are also delicious with other fruit jams or even unfilled. With Donut Mix with Egg as the base ingredient, the dough is kneaded gently. Ensuring the correct dough resting time is essential for good further processing. The rolls can then be filled prior to or after baking. Filling beforehand does, however, require more handwork and time. Flavoured with cinnamon and rum, the stewed plum filling exudes a particularly enticing aroma. Warm little chocolate cakes with a molten chocolate core are currently enjoying great popularity. Embracing the trend, backaldrin’s master confectioners have developed a new recipe, using BrownieMix and placing a chocolate ball made of ganache right in the centre. Both are quick and easy to make: For the ganache, bring the cream to the boil, remove from the heat and dissolve the couverture in it. Leave the mixture to cool and pour into round moulds. To avoid the couverture setting, ensure that the dough ingredients are not too cold. The finished dough with the chocolate centre can be baked in a combi-steamer or in a microwave. Combined with ice cream, custard or a fruit coulis, this is a temptation no one with a sweet tooth can resist. The same is true of the creamy Italian classic, Panna Cotta, which can be made in an instant with Sahnissimo® and dressed with a fruit coulis for a gustatory delight. Through the use of Sahnissimo®, which is crucial to the stability of the Panna Cotta, the dessert can be turned out onto a plate or served in a container. In the practical “to-go” cup, like a breath of fresh air to the product range, Panna Cotta is the perfect in-between treat. backaldrin Master Confectioner Hannes Peherstorfer is passionate about grilling. It is even his preferred method of cooking Kaiserschmarrn. As soon as it is warm enough outside, the grill is started. That it can also be used for desserts is rarely thought of, but Kaiserschmarrn are really quite easy to prepare on the grill, and they are the ideal ending to any barbecue party. Start by heating equal amounts of butter and oil in a grill pan. Pour the Kaiserschmarrn batter into the pan and wait until a light crust forms underneath. Sprinkle with rum-soaked raisins. Divide the batter into four, turn and leave to brown. Cut into smaller pieces and then push the pieces to the edge of the pan. Melt butter and oil in the middle of the pan, add sugar to caramelise. Lightly toss the Kaiserschmarrn and splash with a bit of rum. Briefly close the grill cover so that the dough absorbs the flavour of the rum. Sprinkle with sugar. Enjoy warm with a scoop of ice cream, stewed plums or apple sauce. 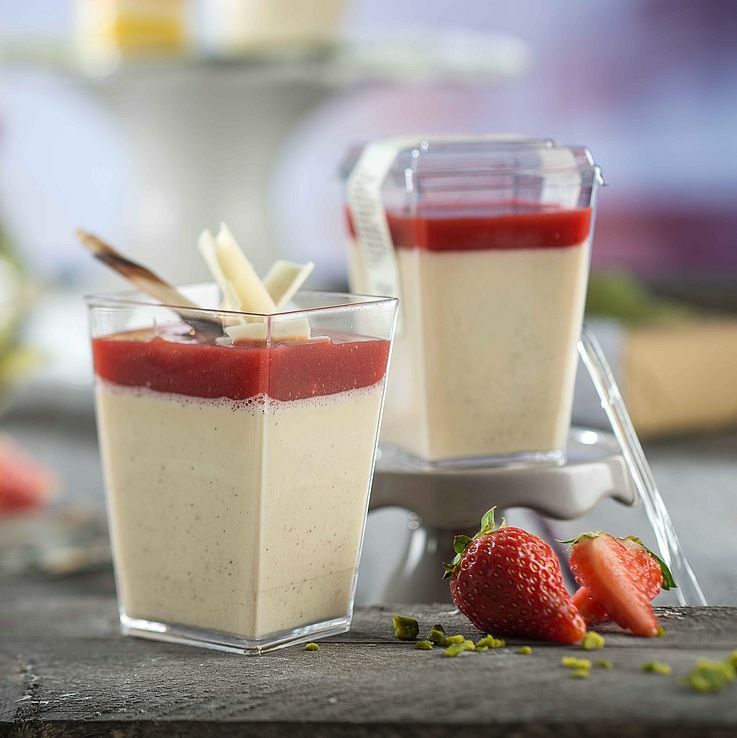 Traditional Italian Panna Cotta is quick and easy to make with Sahnissimo®. In the practical “to-go” cup, it’s like a breath of fresh air to the product range. Kaiserschmarrn has enjoyed great popularity ever since the 19th century. With BiskuitMix Fine, it’s easy to please even an Imperial palate in next to no time. 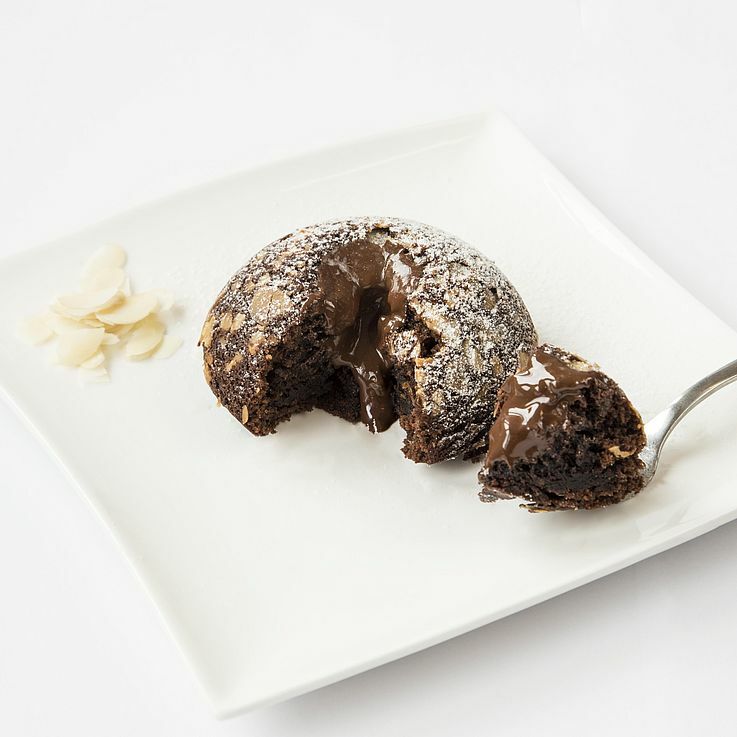 A molten core of chocolate is hidden at the centre of the chocolate soufflé.